Currency overvaluation or undervaluation can have advantages or disadvantages, depending on a country’s circumstances. As part of negotiations for a trade deal with the Chinese, the Donald Trump team seeks assurances that the government will not devalue the yuan or renminbi. But currency valuations are relative and fluid, and governments lack full control. Currencies may become undervalued for natural reasons when political crises increase wariness about that country’s assets or currency, as has happened in Brazil and Turkey since 2013. In other cases, governments deliberately keep the currency undervalued to encourage export sales. The United States and other countries allege the People’s Bank of China has consistently undervalued the renminbi since the early 1990s. A currency’s value can appreciate or devalue against other currencies in multiple ways – market sentiment, deliberate government actions, direct buying or selling in the foreign-exchange market or by fiat in extreme cases when the government dictates the exchange rate. Currencies may become overvalued when foreigners desire that currency in the exchange markets and seek to hold assets in that nation. Currencies can also become temporarily overvalued if the country’s central bank raises internal interest rates. Foreigners seeking to earn higher interest then demand that currency in the spot market. In other cases, especially in the emerging world, countries like India may deliberately keep their currency overvalued for political reasons. ● China’s exporters receive a boost as dollars earned convert into more renminbi than they would otherwise. ● Foreign direct investment is less costly and more attractive to outside investors as their currencies convert into more renminbi for buying factories or local assets. ● Investment and jobs pour into China’s export sector, turning it into the “factory of the world” due to the expectations of consistent undervaluation by the central bank. ● Imports headed into China are more expensive in renminbi, thereby protecting domestic Chinese firms from import competition and retaining investment and jobs in the country. ● Overall investment and jobs increase, crucial for a population of 1.4 billion people. ● Effective protection against imports reduces competition, which can also reduce efficiency and competitiveness of local firms. ● Excess demand for jobs is created, escalating wages in a country with a limited labour supply, which in turn could increase inflation. This did not happen in China initially because of its large population. However, due to the one-child policy, reports of labour shortages have emerged with costs escalating sharply. ● Imports are cheaper in the local currency. This can be crucial for import-dependent populations, where local markets rely on imports for basic necessities like food, medicines or energy. ● Political stability increases. To the extent that the government handles or subsidises imports of necessities, devaluation poses political consequences for incumbents – because basic necessities like energy may have to be imported anyway. Increased costs can contribute to unrest and protests. ● Importing at the overvalued exchange rate is cheaper than local production, especially in import-dependent economies, keeping inflation under control. 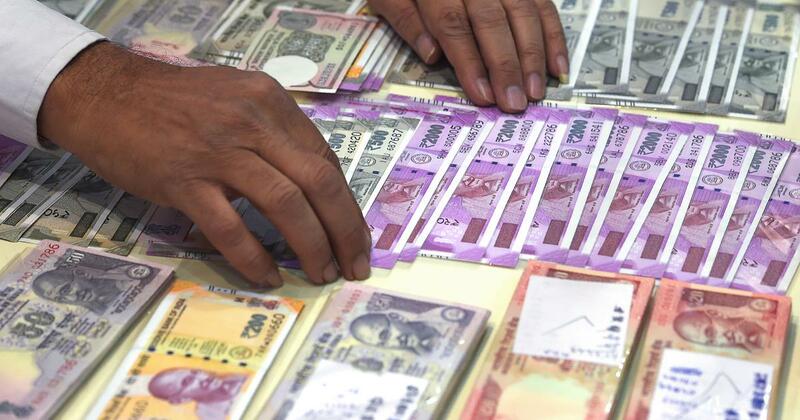 ● Exports may be reduced because companies converting foreign currency earnings, say US dollars, at the overvalued exchange rate do not earn enough local currency, say Indian rupees or Nigerian naira, to justify their costs. ● Imports may appear artificially inexpensive compared with local substitute products, thereby dampening investments and jobs in sectors that could produce locally to compete against imports. ● Foreign direct investment coming into a country with an overvaluated currency is somewhat reduced. Foreign currencies like the US dollar convert into fewer units of local currency, like rupees, with which to buy local assets such as land. Comparing currency values is complicated because comparisons involve converting moneys into one reference currency such as the US dollar, which fluctuates in value, too. Also, living standards and the cost of living vary dramatically across nations, complicating analyses. However, the theory of purchasing power parity, or PPP, provides analysis for the long run. The theory’s main idea is simple: money as such has no value and is merely odd pieces of metal, paper or phantasmal electronic entries. Under the theory, money has value depending on what holders can do with it – what and how much consumers can purchase with that currency. The exchange rate for a currency in the long run, according to the theory, is based on the comparison of its purchasing power versus that of another currency. In the simplest example, if a basket of goods and services can be purchased for Rs 78,000 in India and the same basket of goods and services can be purchased for $1,000 in the United States, then the theoretical purchasing power parity exchange rate should be $1 = Rs 78. As of February 2019, this rate was $1 = Rs 71, suggesting that the rupee is somewhat overvalued. Unfortunately, all currencies eventually lose value through the strange process of inflation – erosion of any purchasing power over time. A number of socioeconomic factors spur inflation, depending on the country. A complication is that currencies lose purchasing power at different rates. In short, the currency that has a higher inflation rate, such as the Indian rupee, should and indeed will in the long run, according to PPP theory, devalue against a reference currency, such as the US dollar that suffers lower inflation. A simple way of calculating this: take the difference between the inflation rate of the rupee and that of the US dollar as reference currency over a suitable period. 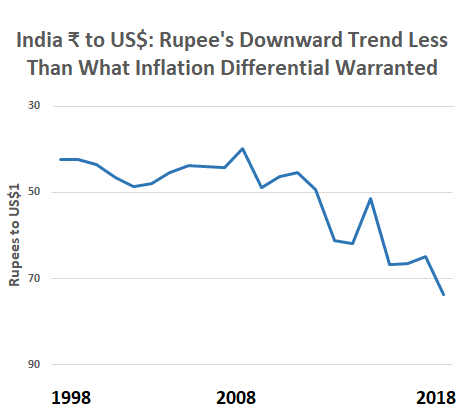 According to a calculation by Niranjan Rajadhyaksha, the Indian rupee should have devalued at a rate proportionate to the difference in the inflation between India and the US, calculated as an average annual 4.15 difference. If so, the rupee should have devalued by 4.15% each year on average. However, it did not. The rupee devalued more slowly, less than it should have, according to PPP theory. That means the rupee is somewhat overvalued. Inflation in the Indian economy has moderated recently, but remains higher than that in the US. If this continues in the long run, the theory says, economists should expect the rupee to continue to devalue against the dollar. Governments and multinationals worldwide study PPP theory, assessing whether currencies are overvalued or undervalued, to determine the best timing for portfolio or foreign direct investments. For example, a country’s interest rate may appear attractive to foreigners, but once the foreign bank deposit matures, value depends on the exchange rate when proceeds are converted. Or consider the fact that many companies in Brazil, Turkey and elsewhere in the emerging world, finding US interest rates irresistibly low from 2011 to 2013, borrowed heavily in dollar-denominated debt. When the loans had to be repaid, say in 2018 after the dollar strengthened, companies found their cost of repayment in local currency so high that it strained finances, forcing some to fail. For governments, PPP theory is useful in deciding how much to devalue or revalue their currencies. For example, the Vietnamese government gradually devalues the dong based on PPP calculations. PPP theory is far from accurate and works best in the long run, calculated over several years, yet it gives executives, investors and governments guidance and insights.